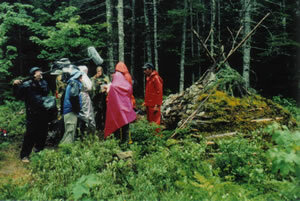 Shooting the rescue for the Discovery Channel's "Lost in the Wild: Nova Scotia." Happy faces after our rescue for the Discovery Channel's "Lost in the Wild: High Desert." Shooting the Today Show on Necker Island, in the British Virgin Islands, with Jimmy Buffett, Vendella, Sir Richard Branson, and Matt Lauer. Cody shooting Winter Survival segment with Dateline NBC in the Arizona high country. Perhaps no one in the field of outdoor survival and preparedness training has the variety of television experience as Cody Lundin. 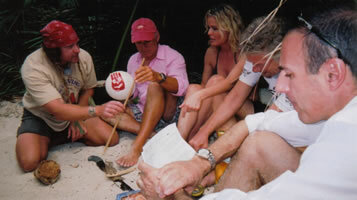 With his penchant for going barefoot, braided hair, quick wit, and alternative lifestyle, along with his professional understanding of the physics, psychology, and physiology of survival, Cody is routinely sought after to help develop or host new network and cable programming. Contact our office for more information or to request a reel of Cody’s prior television appearances at (928) 713-1651, or email us at abodude@codylundin.com. We routinely work with all types of media designing high quality custom footage. Cody Lundin’s expertise in putting together dynamic, professionally rendered "camera friendly" outdoor skills eliminates the guesswork regarding the quality of your final product. Cody will work closely with your production company to ensure your programming needs get met. Contact our office at (928) 713-1651 or email us at abodude@codylundin.com. 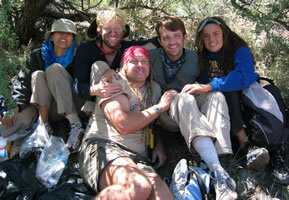 Cody has lived in Arizona since 1987 and knows its diverse landscapes well. Arizona has more terrain and weather variables, within the shortest travel time, of any comparable region in North or South America. Major interstates allow quick, hassle free access to all environments. We have designed alpine winter survival segments in knee deep snow, only to shoot desert survival segments two hours away the very next day. This amazing geographical diversity allows your crew unequaled potential for quickly capturing multiple story concepts under the same operating budget dollar. James Barrat, Producer, History Channel, Discovery Channel, National Geographic, et al.